Historically Black Colleges and Universities (HBCUs) serve the educational needs of students of African descent while providing an atmosphere of nurture and guidance enriched in cultural norms. 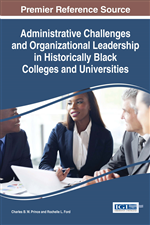 In considering how HBCUs can remain competitive, this chapter recommends that one of the first steps is to return to the basics, reviewing the historical significance, missions and traditions of HBCUs. In doing so, this work investigates the role HBCUs play in student identity and character development by looking at the history, mission and traditions of Morehouse College and Howard University. The authors, who both are alumni of these institutions, respectively, will examine relevant documents and statements from the schools as well as provide auto-ethnographic narratives explicating the impact those institutions had on their academic, social and professional successes. The need for black students to find safe spaces to learn while feeling valued is ever-more urgent. In addressing the question of the necessity of black colleges, Lynch (2014) offered five reasons HBCUs are still relevant, including that HBCUs are havens for the disadvantaged and that HBCUs remind students that there are still battles for civil rights and equality that extend beyond the black community. Thus, the debate about whether HBCUs are still relevant is moot. HBCUs are needed for the training of young black minds, for the retaining of rich cultural history and for the empowering of community, national and global leaders. These realities occur during Black identity development.